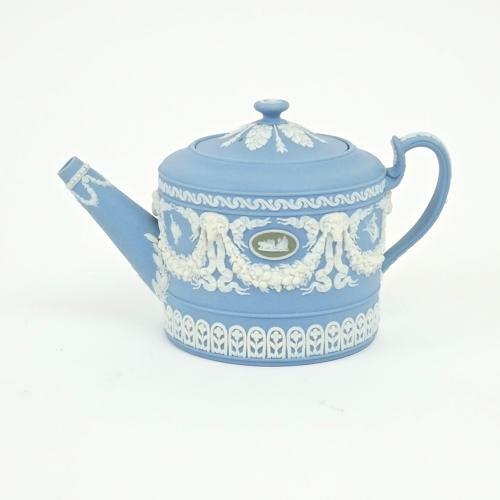 A fine, Wedgwood, three colour jasper ware teapot from the end of the 19th century. This piece is very well potted, from a fine quality, solid jasperware which has a lovely silky feel. It is marked ‘WEDGWOOD ENGLAND’ and it dates from c.1895. It is relief decorated, with small, green jasper panels to either side and these are surrounded by garlands of flowers and ribbons, in white, which hang from ram’s heads. All of the reliefs are superb quality, with beautiful detail, and both the teapot and cover are in perfect condition. Price includes postage with the U.K. and Western Europe. Shipping to the U.S.A. add £20.